What could possibly make fluffy, warm doughnuts better? Um, Big Gay Ice Cream Truck's Dulce de Leche (you know, that awesome sauce that goes on a Salty Pimp). Blondie and friends styled the awesome shot above of my woodland creature salt shakers (and a crab Christmas ornament) surrounding the doughnut. Mischief appears to be afoot! I can't say I blame them. 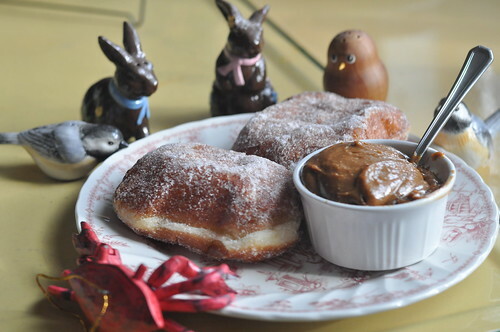 The doughnuts were amazing add the dulce de leche and you have one awesome breakfast/dessert (dessert for breakfast?) combo. Our book is due out next April. All I have to say is get those stretchy pants ready because there are some darn tasty recipes.